Travis Brake, left, and Justin Brackenridge tied with Alex Crowe for medalist honors on Monday when Fairbanks’ boys golf team beat Triad. 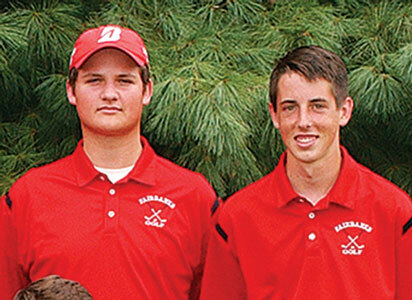 Fairbanks’ boys varsity golf team (11-0 in the Ohio Heritage Conference) defeated Triad, 158-197, on Monday. Justin Brackenridge, Alex Crowe and Travis Brake of FHS tied for medalist honors with matching scores of 39. Seth Payne carded a 41, Aidan Wilson shot a 46 and Logan Bocsy finished with a 47. James Russell and Ryan Gross led Triad as each shot a 48. They were followed by Jalen Nott-50, Devin Butz-51, Cole Pond-52 and Payton Oyer-56. Jonathan Alder’s boys improved to 7-0 in the Central Buckeye Conference, 165-179. JA’s Hayden Mitchell shot a one-over-par 36 to earn medalist honors. Other Pioneer scores were Mychal McKelvey-40, Tyler Hilbert-44 and Liam Thompson-45.